In September 2015 a new ordinance was approved by the Lincoln County Commissioners that essentially makes it illegal, among other things, to fly a drone near the perimeter of the Test Site over public land and take photos or video of anything inside the perimeter. That makes sense and is in line with long existing laws on the ground. Now the Air Force wants to extend the no-fly zone for drones 2 miles outside the Test Site perimeter. That is completely unnecessary for many reasons. Most importantly, the Area 51 buffer zone already extends 12+ miles outside the base. No commercial drone has optics good enough to take any useful photos at that distance. But there are many points of interest, such as historic mines, on public land around the Test Site. The proposed ordinance would greatly restrict exploring these historic sites with drones for no good reason. 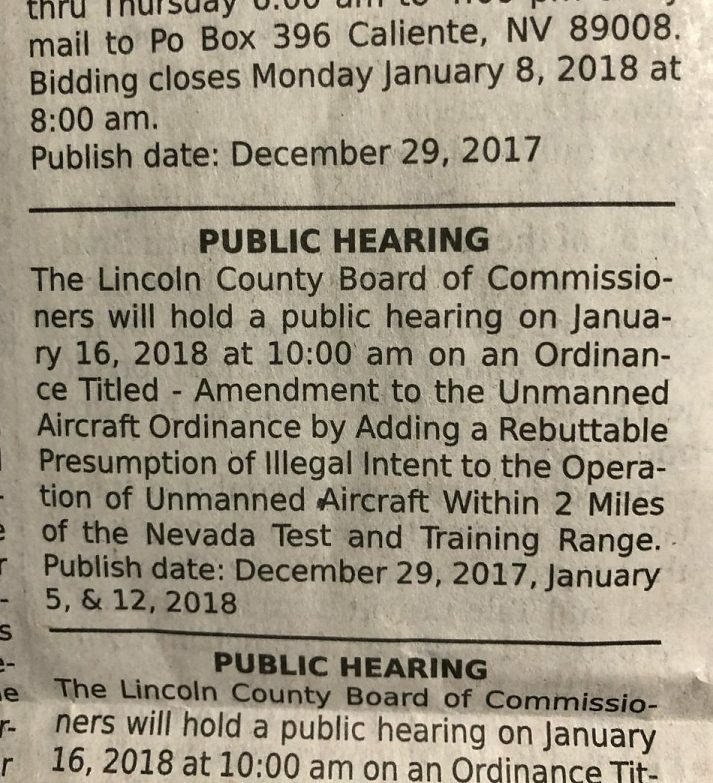 Per the included notice from the December 29, 2017 Lincoln County Record a hearing will be held in Pioche next Tuesday, January 16, 2018 at 10am. I will be there and I encourage anyone who can arrange it to be there and to voice your concerns with the proposed extension of the no-fly zone. Thank you!